This Indian chief metal wall art sculpture is quite something to behold. Cut from steel and finished by an artist, each piece is a lovely piece of contemporary Native American art. Due to temperature and humidity variations that cause color differences as the metal wall art is finished, each piece is unique. A novel metal art piece for your study, living room, den, office, restaurant or even outside on a fence or garden wall, this Indian chief metal wall sculpture will be a focal point and conversation piece in your home. Although this metal wall sculpture is not Native American made, the artist is a collector of contemporary Native American Indian art and has made his indian chief metal wall art piece with humble appreciation for the native culture. The sculptured chief carries a peace pipe and wears a buffalo token. This Native American Indian chief sculpture measures 38 inches x 18 inches high and is available in two finishes: rust (brown) and rustina (shown above). To create a stunning wall display, combine the Indian chief with other pieces from our metal wall art collection. Order to delivery time is 4-6 weeks, so don't delay. 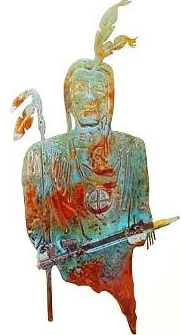 Order you Indian chief metal wall sculpture today.